The Most Recent - Page 28 of 28 - Blackburn Architects, P.C. : Blackburn Architects, P.C. With energy prices increasing every day, it’s more important than ever to design your barn with intent to maximize its amount of natural light. Not only will careful design consideration reduce your dependence on electricity—saving money and energy—it fosters a healthy environment for you and your animals. I have several techniques that ensure I never take light lightly (excuse the pun). One of the most effective ways of incorporating natural light into a barn’s design is through a continuous ridge skylight. Typically, this type of skylight runs the length of the barn, commonly down the center aisle, and results in ample natural light throughout the day. Most of my designs allow a barn to run without the use of electric lights during the day, with electric lights serving only as a backup during inclement weather and for nighttime use as needed. Other high placed windows, especially around the eaves of the barn, increase natural (and free) lighting even more. These higher placed windows allow the light to reach greater depths of the barn and reduce injury risk since they’re out of the reach of your horses. Still, the use of shatterproof glass is imperative. For the electric lights you’ll inevitably have (but only occasionally use if the design is right), safety and the type of light are two primary concerns. For lighting in the aisles I tend to favor metal halide, which takes a moment to warm up and functions best in areas that are turned on/off infrequently. The higher up, the more effectively the lights can provide decent light. A three-way switch near end of the aisle can help you control what areas to light, which saves you from turning on lights in the entire barn unnecessarily. Stall lighting generally uses one switch per stall with a light on each side to counter shadows, which is helpful when working on a horse. A shatterproof lens paired with cage protection is vital for the horses’ safety, and should never be overlooked. Typically, florescent lights are cheaper to operate and carry fewer fire risks than incandescent. While the light fixtures are more expensive—and ballasts may be needed to protect against cold weather—energy-efficient bulbs and fixtures will cut down costs and resource strain in the long run. A few weeks ago, Cesar, one of our project managers, and I went to Meggett, South Carolina for a site visit. We planned our visit to review the ten recently completed stalls added to an existing ten-stall barn on the property. Soon, the barn will also have a larger tack room and lounge. In the next phase of work, our design plans include adding a full-ridge skylight across the length of the barn to maximize natural light as well as improve ventilation. Upon our visit, two things struck us: the humidity and the regal old oak trees with Spanish moss scattered across the property that provide ample and much-needed shade (and, of course, natural beauty and Southern charm). Otherwise, the 63-acre property set in South Carolina’s Low Country is relatively flat with large and open grassy paddocks. 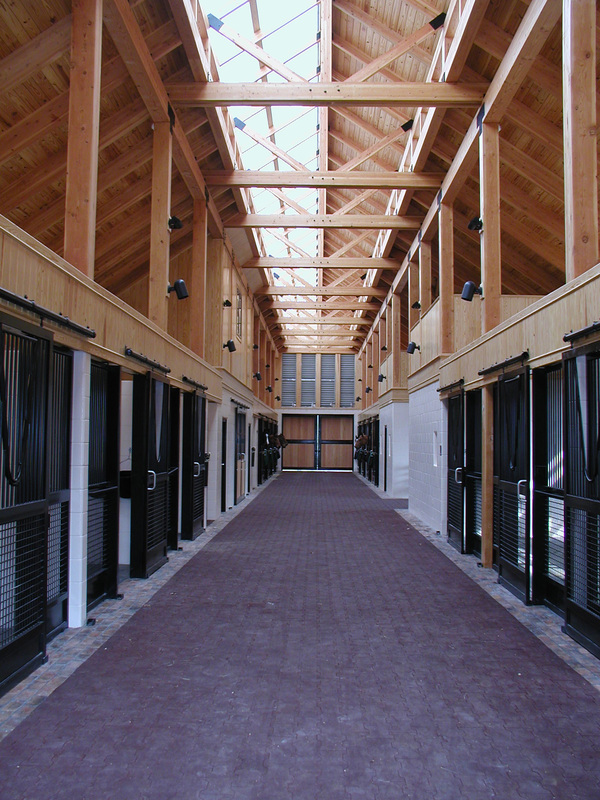 This project required expedited design and construction, since the client had to move her horses across the country before the end of the month and the stalls had to be ready before their arrival. This timeline left our team less than a month to undertake concept design to completion of construction. And, thanks to the efforts of Jack Hart and Jimmy Thompson of Advanced Construction, Corbin, KY, who put in overtime and weekend hours, in conjunction with extremely fast turnaround by stall systems production at Lucas Equine, the stalls were installed quickly and efficiently. Given the heat and humidity, this was no small feat. The property also has an existing 1-story residence, garage with apartment, small outdoor arena, and several existing paddocks. Future design plans include the addition of a riding field, 4-stall foaling barn, pool with pool house, round pen, covered arena, and hay/bedding storage. Here’s a video of the new stalls, now home to some very grateful horses. While the nation struggles with rising fuel prices and worries collectively about alternative fuel sources, offshore drilling, and new nuclear plants, there is an obvious and effective way to reduce our energy problems with immediate impact—conservation. One of the best steps you can take to conserve energy is to not use it and the best way to not use it is to plan efficiency into your farm, stables, and home. Writing last week in The New York Times, Bob Herbert called this route to energy independence, “The Winning Hand” in his editorial responding to the Joint Economic Committee hearing on using energy efficiency to solve the energy crisis. Conservation has been advocated for decades by Jimmy Carter, Al Gore, Senator Chuck Schumer and many, many others as a huge step toward energy independence and reversing the trend of global warming. The enormous potential impact of energy conservation may lack the punch of newer technologies such as solar panels and wind farms and the quick fix associated with offshore or Arctic drilling. However, the cumulative savings in the reduction of the energy we use across the board from personal transportation choices to household conservation can be a tremendous offset to our national demand for oil. I’ve been building energy efficiency into farm plans and stable designs for decades. Energy efficient details include designing for ample natural lighting and harnessing the power of the sun and wind to create passive ventilation. Moving beyond designs that facilitate the conservation of energy, stables and arenas present nearly perfect opportunities for harnessing solar energy on their expansive rooftops. Farms and ranches often have the right conditions to harness wind energy. Generally located in rural or open areas, the size and shape of barns and arenas offer perfect opportunities for channeling and capturing existing wind currents to create natural ventilation. But even if these steps are beyond your budget, designs that reduce your farm’s demand for energy are available and affordable and will create energy savings into the future. Greetings equestrians and welcome to my Blog dedicated to the care and shelter of horses. While my expertise is the architectural design of equestrian facilities, I am part of the larger community of horse lovers dedicated to the humane treatment of horses and all animals. It is in that spirit that I’d like to call your attention to important legislation that is currently under consideration in the U.S. House of Representatives written to prevent the cruelty inherent in the horse slaughter industry. As horse lovers who give the greatest care to your animals, you may not realize that despite the fact that the last horse slaughter factory in the U.S. was closed in 2007, that there is still a market for the transport of horses across our borders to Canada and Mexico for slaughter for horsemeat. I was surprised to learn that there were still horse slaughter facilities in our country as recently as last year and stunned to know that horse for horse, the same number of horses are now finding their way across our borders for slaughter. The transport of horses across long distances in extreme temperatures simply adds to the degree of cruelty inherent in the horsemeat industry. According to Representative John Conyers, Democrat from Michigan, and Representative Dan Burton, Republican from Indiana, authors of H.R. 6598, The Prevention of Equine Cruelty Act of 2008, amends a previous section of U.S. Code that prohibits cruelty of animals for financial gain. That code, Chapter 3 of Title 18 of U.S. Code, resulted in the closure of the last horse slaughterhouse in the U.S. just last year. However, it didn’t anticipate that the market for American horses for slaughter would simply move across the borders to Canada and Mexico therefore increasing the suffering of horses destined for slaughter. If you’re interested in an eye-opening, in-depth history of the consumption of horsemeat, you should see the March 2008 issue of Horse Connection Magazine. Editor Geoff Young shined the light on this American taboo. Please let me know what you think about this important issue. 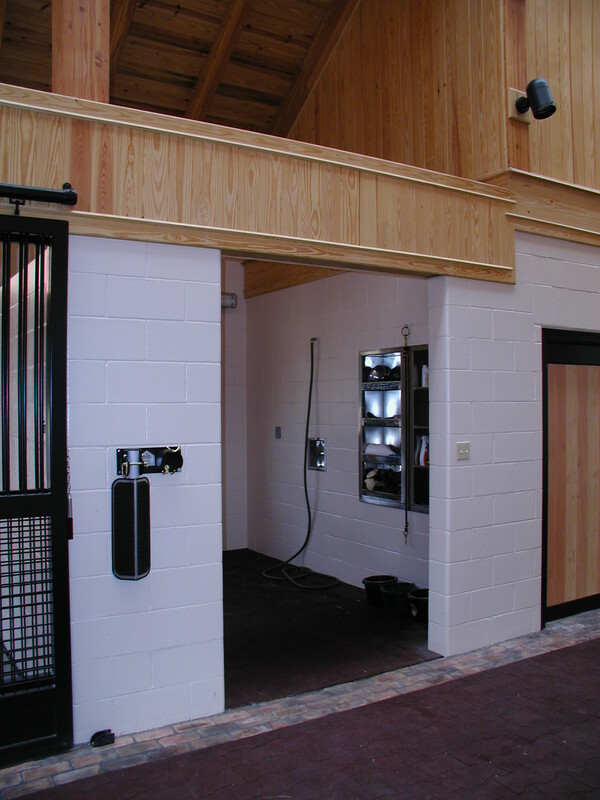 Ventilation is one of the most important considerations when designing a barn that is healthy for your animals. Without superior ventilation, your barn becomes a breeding ground for disease and contamination. Luckily, good ventilation doesn’t require expensive equipment or running energy-guzzling systems. A ventilation system that reduces the risk of disease and benefits the environment is easy to achieve—given the right design knowledge and techniques. The goal for a healthy stable is upward ventilation. Mechanical systems, like electric exhaust fans, are not only expensive to maintain and run, but can put the safety of your barn at risk. Most obviously, mechanical systems can be a fire hazard. Yet they also pose danger by the way they ventilate: exhaust fans draw air laterally across the barn. The horizontal airflow increases the risk of passing pathogens and unhealthy gases from one stall to the. Upward, vertical ventilation minimizes the amount of damp, stale, contaminated air in the stables, which prevents the risk of spreading disease. All of my designs create this type of ventilation, which harness natural solar and wind power to effortlessly provide a strong interior current and upward movement of air in the barn. Even on a still summer day, the air current in a Blackburn-designed barn should be strong enough to ventilate the entire interior. A few factors enable this energy-efficient, healthy ventilation system. First, the large roof surface of barns and arenas capture solar energy, heating the air at the ceiling. Heat generated by the horses also rises, as long as stalls are designed with open ceilings that allow air to freely flow upward. As warm air rises and accumulates at the ceiling, cooler outside air is drawn in near the floor, creating a vertical airflow path. Proper design of vents along the barn roof permit the hot, damp air to escape, making room for cool, dry air to enter through stable openings low in the perimeter walls. Second, the roof surface captures the natural wind flow to maximize the amount of fresh air entering the barn. Wind moving over a large, steeply sloped roof produces high pressure on the windward side of the barn, which is balanced by low pressure within the barn and on the leeward side. This Bernoulli effect pushes hot air out and brings in fresh air. Placement of the barn with regard to the prevailing wind patterns can maximize this effect, increasing the amount of fresh, clean air in the barn. By combining the power of solar energy with natural wind, a barn designed using these principles can function as a large, air-circulating machine, eliminating the need for air conditioners or heaters. The result is a healthy stable for you and your horses. Designing a barn for health and safety is somewhat of a catch-22. After all, the best environment for a horse is outside; not confined in a barn. But since a horse, when given the chance, will find a way to injure itself, design with a keen eye for health and safety guarantees you won’t make it easy for them. While there are several ways to plan your farm for health and safety, like implementing strategic building placement and maximizing natural light and ventilation within the barns, let’s focus on the details. These vary from stall design to details like types of latches and bucket hooks. Never use swinging doors, since the wind can force them to open and knock into a horse. It’s often difficult to tell if a hinged door is unlatched, as the door may appear closed even if it is not fully latched. A sliding door allows the door to remain open while the horse is removed from the stall without much effort or fuss, making it safer for both the horse and the handler leading it back to the stall. Also, when looking down an aisle, an open sliding door can easily signal an empty stall. The pin latch is a simple, low maintenance, and inexpensive system for sliding doors, whereas hinged doors require a slightly more complex mechanism that may malfunction or expose bolts to horses. The aisle width as well as the materials or finishes are important to consider. Ideally, an aisle is comprised of horse-friendly materials and kept clear of obstructions, sharp objects, and sharp corners. Recess anything that protrudes into the aisle, including hydrants, switches, ladders, fire extinguishers, etc. Similarly, provide several hydrants along the aisle to avoid pulling hoses down the aisle. Muck wagons, tractors, and the like do not belong in the aisle and can injure the horses if carelessly stowed. Like in the aisle-way, continue use of horse-friendly materials like interlocking rubber-bricks, and remember to recess any fixtures that may injure a horse when it moves around the stall. Either recess the hose reel or use a hose with an overhead wand, which is less likely to entangle the horse during bathing. The back corner of the stall should have a recessed area for a shovel and muck bucket. This area can also double as a safe area for the handler in the case of an unruly horse, which may otherwise back its handler into a corner. A well-designed barn that reflects a careful regard to health and safety requires a lot of consideration. Over the past 25 years, we’ve developed a library of details that prove to be safe, economical, and often, practical. And while no barn is totally hazard-free, minding the details during the design process can provide the safest possible environment for those times your horse simply cannot roam as free as it pleases.